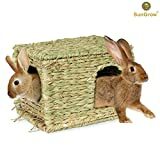 ... and if they can do it in a cute little hide-out, it will be an awesome addition to the cage for both you and your little piggy. Today, we've rounded up the best and cutets options out there which you can find below. As always, we'll be starting with our number 1 pick. If you want a hide-out that can’t be consumed by your guinea pig and will prevent you from purchasing over and over again, then the Emours Warmly house cage is for you. It is made from soft and comfortable flannelette that you can wash to clean. 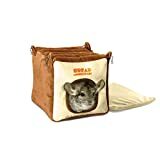 You can also take out just the bedding inside if you are not yet ready to wash the whole thing, This hideout is best used during the winter season since the material used is quite warm and may overheat your pets especially if they have thick and long fur. You can choose whether to put this on the floor or hang it on your pet’s cage to save some floor space. Either way, your guinea pigs will enjoy being inside of this because of its coziness and the privacy they will get. One of the most common materials used in making guinea pig hideouts are grass or plant materials. The Prevue Hendryx 1097 is hand-made and from 100% natural sisal tassel. Since this is made from a plant material, it is totally safe if your pet chews it from time to time. Hand-made products usually have differences in size and physical appearance. A lot of pig owners say that when they receive their order, it looks completely different than what is in the picture. In addition, since this is a natural material and tend to decay overtime, expect that there will also be a difference in its aroma especially if the item you get has been out in the market for some time. The standard size of this hideout is 11”L x 9”W x 6”H – good enough for two guinea pigs. Great thing about this product is it has 2 entry ways so they can both stick their heads out. Like the Prevue Hendryx 1097, this one is also hand-woven and made from natural raw materials. It is edible and completely safe for your pet to snack on. Since they are hand-made, expect that there will be a slight difference on the size and appearance. This hideout is foldable for easy storage or if you want to use it as just a mat. However, we don’t really see that feature useful. Hideouts are made so that your pet can go inside anytime if they want to have privacy. Therefore, storing it is not recommended. Two guinea pigs can fit inside comfortably. There are 2 entry ways, one which is circular in shape and the other is arc-shaped. I did mention that this is made from natural materials and is completely edible, right? Obviously, your guinea pig will have a bite on this product and will eventually consume all of it. In my opinion, it is quite expensive just to be eaten.